Our hotel has 14 single rooms. Our rooms are without luxury, but they are neat and clean and most of all very quiet. Continental breakfast is included. And delicious. 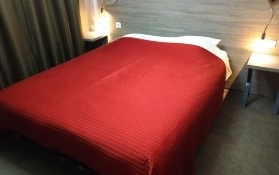 Comfortable and affordable lodging in the centre of Louvain. It is possible. 1. 14 rooms with breakfast or halfboard at the best rates. 2. 15 minutes by train from and to Brussels National Airport. 3. Located opposite the train and bus station of Leuven. From breakfast to half-board. A tasteful stay in Louvain. Very friendly staff, location near towncenter, very clean, big room, good bed. Lot’s of choice at the breakfast. No noise from the square or from other rooms. Perfect. And cheap. Great place to stay! I can’t say anything bad about this hotel! The location is fantastic, the staff is friendly. Rooms are spacious and clean. The breakfast is very good and offers a lot of choice. I will definitely return to this hotel! Very clean and quite hotel for such a good location. One of the best price-quality hotels I have tried so far in Leuven. Just across the train station and a short walk to the Grote Markt. The staff were very friendly and helpful, the room was clean and the breakfast was delicious!